The worst thing about London Overground is the mandatory 18 minute wait on Sunday evenings in the grimmest part of London. The best thing about London Overground are these swish new benches you get to wait on. Joined up thinking. How long do you think that they will stay looking "swish" ? Also a few of the enclosed waiting areas at Willesden and Brondesbury Park and been removed. 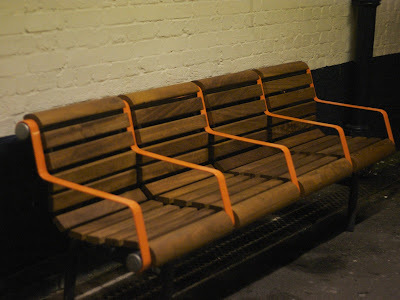 I agree - these benches are smashing, and with the nice "retro" cream and orange repaints going on at the stations, will look nice. 2008 All stations cleaned and repaired. So things are on the way judging by the huge ammount of painting and cleaning that has been going on since day 1 of the takeover.. Roll on the new rolling stock..
Worthy of feature on this site perhaps, Mr Thant? The new benches are much warmer to sit on than the old meatal benches were. But I can't help but wonder how long it will be until someone sets one on fire. I'm thinking of starting a support group for regular users of Willesden Junction station, plus others on the miserable route to Harrow & Wealdstone. Is it only me that gets depressed, wondering what they did to deserve such a life? Also, who would agrees that reopening a station on the Euston mainline for Willesden Junction will be a good idea? I guess this is only relevant to those who live in Harrow. I would be interested in a Willesden Junction Users Group. There is already a WLL Group at http://www.westlondonlinegroup.org.uk/. Willesden Junction is much better than it used to be, but has a lot of potential for improvement.